Blueflame ventfree heaters, Plaque infrared ventfree heaters as well as Comfort Glow ventless heaters, ventless Reddy heaters and outdoor gas Fire pits. 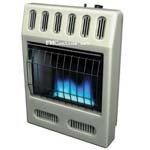 Glo-warm Blueflame Ventfree Heaters - We offer a complete selection of natural gas and propane Glo-warm blueflame ventfree heaters and Glo-warm ventfree heater accessories. The Glo-warm blueflame ventfree heaters are available in 6,000 btu thru 30,000 btu ventfree models that come with a wall bracket for mounting. Glo-warm vent free heaters are also known as vent less heaters or nonvented heaters and are manufactured by Desa. Glo-warm Plaque Infrared Ventfree Heaters - We offer a complete selection of natural gas and propane Glo-warm plaque infrared ventfree heaters and Glo-warm ventfree heater accessories. The Glo-warm plaque infrared ventfree heaters are available in 10,000 btu thru 26,000 btu propane models, and 10,000 btu thru 30,000 btu natural gas models. The Glo-warm ventfree heaters come with a wall bracket for mounting. Glo-warm vent free heaters are also known as ventless heaters or unvented heaters and are manufactured by Desa. 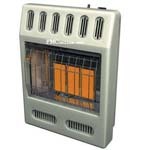 Comfort Glow vent free heaters and vent free heater accessories are available in natural gas and propane heater models. Comfort Glow has blue flame and plaque infrared heaters available. Comfort Glow Plaque infrared heaters Reddy heater vent free garage heaters come in natural gas or propane, Reddy blueflame heaters are available in manual or thermostat control. Reddy heater offers a vent free heater for the outdoorsman, it is a 10,000 btu propane model designed for the ice shanty or hunting blind. Reddy heater also has a complete line of portable construction heaters including kerosene forced air heaters and propane forced air heaters. Gas Fire Pits - The outdoor gas fire pits come in natural gas or propane (LP) fire pit models. The patio gas fire pits give you the heat of a camp fire without the mess, or the smoke. Gas fire pits are made for outdoor use only and require hook up to your gas supply. Replacement Parts? FMConline.net does not sell Comfort Glow repair parts for gas logs, heaters, fireplaces or generators. We distribute a variety of Comfort glow, Master, Remington, Glo warm and Reddy heater products including, Comfort glow vented fireplaces, Comfort glow vent free fireplaces and vent free fireplace accessories, Comfort glow gas logs, Comfort glow cast stoves Comfort glow pedestal stoves, Comfort glow blue flame heater, Comfort glow plaque infrared heater, Comfort glow heater accessories, and Glow warm vent free heaters, as well as Master generators and Reddy heaters in propane, kerosene and natural gas units.